He’s debated some the world’s leading atheists.He’s traveled the world defending the Christian faith. He’s published landmark books on apologetics and philosophy. But now professor William Lane Craig is taking on an entirely new challenge: children’s bedtime stories. The What is God Like? series, based on stories Craig wrote for his own children, consists of 10 different books. With titles such as God is Spirit and God is Everywhere, each story deals with a different attribute of God and is played out by a cast of animal characters. Brown Bear and Red Goose are the stars of the series, along with their gosling, Charity and their cub, John. The family of characters is based on Craig’s own family, he said, and he’s been drawing the bear and goose for his wife, Jan, for over 40 years. Every book in the series is illustrated by a young California artist, Marli Renee, 18, who teamed up with Craig after her father sent the author some of her artwork. “Children are going to love these characters and that will make theology fun for them,” Craig said. 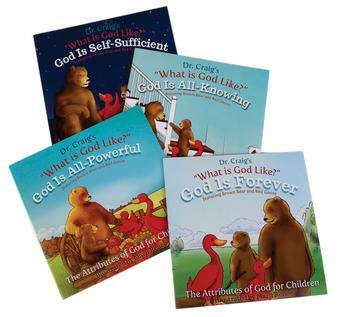 The collection of children’s stories adds to Craig’s already extensive range of apologetic resources for students and scholars, including such well-known works as Reasonable Faith and Philosophical Foundations for a Christian Worldview. The new series is available for purchase on Reasonable Faith’s website, as well as on Biola’s apologetics resource page. In February, William Lane Craig debated Duke University philosophy professor Alex Rosenberg, an atheist, on the question "Is Faith in God Reasonable?" at Purdue University. Nearly 5,000 attended the event in person while nearly 10,000 streamed it live online for free on Biola’s website. You can watch the video below. You make it so hard to find and order William Craig's books for children.